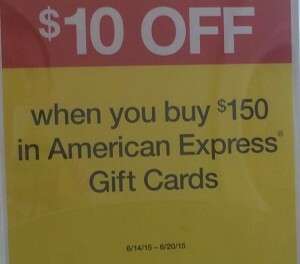 Officemax and Office Depot are giving $10 off the purchase of $150 or more in American Express gift cards. Unlike Staples that requires a rebate, this discount is taken off instantly at the register. Generally with deals like this one it is best to use a Chase Ink card to earn 5X Ultimate Rewards points or an Amex SimplyCash card to earn 5% cash back since both Officemax and Office Depot are categorized as office supply stores. $200 and variable load cards are excluded. I gotta buy TWO amex cards and only limit one?? Pass. Anyone know if either of those places carry $200 gc? That might work better. $200 GC specifically disallowed. That’s why this is a non-starter. So since it’s 1 per customer, hypothetically you can go in there number of times and get this, correct? I think for the extra work, the return is minimal. It is absurd that they will not allow the purchase of a single $200 AmEx card. Of course, I could spend $20 in gas to do it 3 times in the same day, recovering $30 against my $61.70 in gas & fees! PASS on this one. You still have to convert these to VGC or MCGC to get rid of them. If RB/AFT loads with CC still worked it’d be great but as it stands now it’s not worth the effort. $5.95 fee for the $100 card. So $11.90 for $200 AGC (2 x $100), net $1.90 for $200 with the extra difficulty of liquidating them. Still $1.90 plus some hassle for 1010 UR points isn’t bad. Of course, if the hassle includes buying VGC, well, may as well just buy the VGC straight and skip the extra $1.90 cost. Good luck in finding a merchant in Dallas, Texas who will accept AMEX gift cards.